Looking to appeal to two types of business users, Samsung today unveiled a pair of Windows 10 devices, adding more options to its current lineup of enterprise-geared mobile products. Earlier this year, the company released the Galaxy Tab Pro S, a tablet hybrid device built to compete with the iPad Pro and Surface Pro 4, as well as the Notebook 9 Ultrabook aimed at executives and road warriors. Joining the Samsung family are two versions of the Notebook 7 Spin -- a device that combines the traditional structure of a notebook, with a flexible display for tent-mode or tablet-mode. The Notebook 7 Spin comes in 13.3-inch and 15.6-inch models, each aimed at a different type of business user. The 13.3-inch model features an Intel 6th Generation Core i5 processor and fast-charging technology and is designed for what Samsung describes as an "office knowledge worker." The 15.6-inch model features an Intel 6th Generation Core i7 processor, nVidia 940MX 2GB graphics, fast-charging and a hybrid drive and it's aimed at office power users. Both devices feature Samsung's "quick charge," boasting two hours of battery life off a 20-minute charge and a full charge in under 100 minutes on a completely dead device. Samsung points to IDC number that predict a steady decline in traditional notebook sales and a year-over-year increase in convertible sales between now and 2018. Jen Langan, director of Mobility Product Marketing, says that Samsung has seen an increase in the consumerization of IT as more business users turn to convertible options over traditional business notebooks. Langan says enterprise users are looking for something that combines the traditional clamshell notebook with the flexibility and collaboration options that come from a flexible touch-screen display. While the Tab Pro S was aimed at what Langan calls "ultra-mobile" users, the 7 Spin series is for employees who want more flexibility, but still typically work from home or the office more days than not. The entry-level 13.3-inch device boasts a Full HD PLS touch display, the option of either 4GB or 8GB of RAM, a 500GB hard drive, Intel HD graphics, a backlit keyboard, an estimated 11-hour battery life, as well as HDMI, USB-C, USB 3.0, USB 2.0 and MicroSD ports. The device measures just .78-inches thick and weighs in at just under 4 pounds. If you need a little more power in their device, the 15.6-inch model features a Full HD PLS touch display, 4GB or 8GB of RAM, a hybrid drive with a 128GB SSD and a 1TB HDD, a battery life of around nine hours, as well as HDMI, USB-C, USB 3.0, USB 2.0, Gbit Lan and 3-in-1 card reader ports. The device is the same width as the 13-inch model at .78-inches, but it weighs a bit more at five pounds. The hybrid drive gives power users -- especially those who may have large documents, data sets or creative files to store -- the speed and efficiency of an SSD for apps and programs, with the added reliability of a HDD for storage. Samsung also included "business ready" features in both devices -- including extended service contracts, dedicated business support and a buyback program. The buyback program will allow IT departments to send in any old devices -- they don't have to be Samsung -- to a third-party vendor that will assess the value. 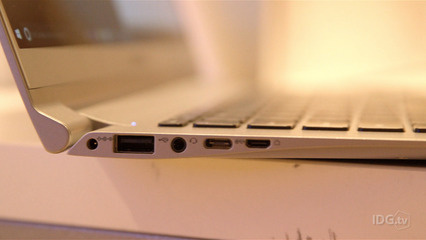 That money can then be put towards the purchase of Samsung enterprise convertible devices, like the Notebook 7 Spin. There will also be a dedicated service queue for businesses, so they won't be stuck on hold waiting among consumers when it's time for service. Both devices will be available July 18, with the 13.3-inch model starting at $899 and the 15.6-inch model starting at $1,299.